Do I Need a Recovery Program? Vicodin, a compound of acetaminophen and the opioid hydrocodone, is a highly addictive painkiller typically prescribed for mild to moderately severe pain. Drowsiness and lethargy are common as are difficulties in concentration and focus. Overall, the capacity to perform daily tasks such as driving is diminished. Some do become energetic with use although this is less common. A feeling of body weakness. Pain medications with acetaminophen and hydrocodone are the most commonly prescribed medications in the US. The number of prescriptions for this class of drug increased from 76 million in 1991 to nearly 207 million in 2013. The US consumes almost all of the hydrocodone that is prescribed in the world (America's Addiction to Opioids: Heroin and Prescription Drug Abuse, 2014). Vicodin abuse occurs when it is used for reasons other than those for which it is legitimately prescribed and/or in ways it is not prescribed. Vicodin abuse occurs when Vicodin is used for reasons other than those for which it is legitimately prescribed and/or in ways it is not prescribed. Using at times or in higher dosages than the prescription indicates. Using illicitly obtained Vicodin along with that which has been prescribed. Using other substances to increase the effects of Vicodin or to 'stretch' the Vicodin prescription. Illegally obtaining the controlled substance for 'recreational' use without a prescription. Obtaining prescriptions by false symptom reports, for example, or obtaining prescriptions from more than one prescriber, commonly referred to as "doctor shopping". Becoming withdrawn from usual contacts and usual activities. Repeatedly reporting Vicodin as lost or stolen to prescribers or pharmacies. 'Nodding out'--becoming dazed, drowsy or sleepy. Low engagement, minimal focus and slow responses. Seeing more than one doctor ("doctor shopping" to obtain multiple prescriptions). Asking for or stealing money and using money allotted for other things on Vicodin. Giving vague responses, lying directly or by omission and/or being secretive. Having strained relationships due to neglect or conflict. Neglecting usual roles, obligations and responsibilities. Using Vicodin in combination with other drugs. Opioids like Vicodin are some of the most abused drugs in the world. They are often combined with benzodiazepines like Xanax in order to increase their effects. Alcohol is also often combined with both types of drugs. Such poly-drug use has a high potential for harm and can be life-threatening. All these drugs have depressant effects upon the brain and heart as well as the nervous and respiratory systems; increasing the probability of overdose. In fact, poly-drug use is a significant predictor of overdose. Loss of control and unmanageability. Physical tolerance develops with continued use. Higher doses--or more frequent uses--are needed to achieve the desired effect. Tolerance is accompanied by cravings and urges to use Vicodin as well as withdrawal symptoms if one's dose is lowered or stopped. Taking more Vicodin than is intended. Spending a good deal of time obtaining, using, or recovering from use. Giving up family, social, occupational, academic or recreational activities. Using Vicodin in situations that expose oneself or other, to physical harm; such as driving or operating machinery. Failed roles, obligations and responsibilities. Continued use despite knowledge that a physical or psychological problem was caused or made worse by Vicodin. Who currently use of another painkiller. With current problematic use of another class of drug. Who use frequently, take a higher than average dose, use non-oral methods of use. Who have a reinforcing social context for use and positive user expectations. In general, however, anyone who uses Vicodin for an extended period is at risk due to its addictive qualities. Anyone who uses Vicodin for an extended period is at risk for addiction.Some individuals with poor coping strategies for psychological issues are also at risk for Vicodin addiction if there is easy access. Self-medication with Vicodin can occur among people who have untreated conditions such as trauma reactions (PTSD), Anxiety Disorders, Bipolar Disorder and depression. Additionally, youth with access to Vicodin in their homes or among peers are at risk. Prescription drugs, if abused, can be quite dangerous. If you or someone close to you is struggling with Vicodin abuse, contact us at 1-888-993-3112Who Answers? today for information about prescription drug addiction treatment programs. Having a need for increasing amounts of Vicodin in order to feel the way you want to feel. Having withdrawal symptoms when taking a lowered dose. Running out of your prescription early. Seeing more than one prescriber for Vicodin. Combining other substances with Vicodin. Having unstable moods and thoughts of self-harm. Incurring significant losses because of Vicodin use. Having symptoms of mental decline. Find a Meeting Narcotics Anonymous offers 12-step meetings around the country, virtually every day of the week. Locate a meeting for you or your loved one. It is helpful to remember that Vicodin Use Disorders are medical conditions. Your loved one is not able to use willpower alone to stop using. In fact, abrupt cessation can create a serious health crisis and withdrawal should be managed by a physician to handle escalated medical complications. Keep in mind that you cannot control your loved one. You can only offer hope and help. Educate yourself about Vicodin and treatment. Find out what is needed for safe withdrawal, the signs and symptoms of crisis, what treatment programs are available in your community and how one is admitted to them. Have open and frank discussions with your loved one. Approach the subjects of addiction and treatment directly and compassionately. Keep a calm demeanor--be supportive, direct, kind and assertive when talking about your concerns. Give your loved ones facts about addiction and options for treatment and recovery. Offer to assist them in committing to a treatment program and support them in their recovery. Express your love and concern often. Avoid outbursts, conflict and ultimatums. Take care of yourself and your responsibilities apart from the addict. Join a support group for loved ones of addicts and/or seek counseling for yourself. Always call for emergency medical assistance when your loved one appears in distress or is non-responsive. Act quickly when your loved one expresses a willingness to enter treatment. There is a wide range of Vicodin treatment options. Treatment settings include outpatient, inpatient, and residential and partial hospitalization. Consultation with an addiction professional can help determine which option is best. 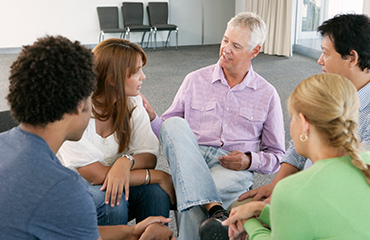 Sessions for individual, family and group therapy can be found in an outpatient setting. Typically these are scheduled on a weekly basis at most and participants continue living at home. Consider whether outpatient treatment can provide enough help at the time. Many choose instead to leave home to have more structure and more support. Also, leaving home provides respite from the daily life in which addiction developed and one can avoid triggers that enabled use. Many choose outpatient services later as a 'step down' from more intensive services. Residential programs require you to stay in a treatment center for a time. Not all programs offer medically supervised withdrawal and detox, 24-hour nursing care or daily physician supervision. In these cases, withdrawal and detox will need to be done in a medically supervised environment before admission to a residential program. Residential treatment is very effective for those who need a lengthier period of time away from the community in order to gain momentum in their recovery. Hospitalization offers medical care for withdrawal and detox as well as a 24-hour medical environment. It's a good option if you've used Vicodin heavily or for a long time, or if you have health problems that could complicate withdrawal or a dual diagnosis. Partial hospitalization gives structure and built-in support to life at home. It is often a 'step down' from having been in a treatment facility or hospital. Participants attend therapy sessions for some hours per day, usually several days per week. These treatment centers offer resort-like settings in pleasing locales with private rooms and spa-like amenities. Programs vary, but there may be massage, meditation, acupuncture, hiking, tennis or golf and specialized nutrition. Some treatment centers also allow executives to continue their business obligations. Access to technology such as computers, phones and fax machines allow executives to stay in touch and contribute to the welfare of their businesses as necessary. improve one's emotional and psychological well-being and identify coping strategies to deal with the void one inevitably feels during abstinence. Relapse prevention strategies are also emphasized and community involvement is encouraged to ensure continued success. A great many teens have access to drugs--in their own homes and from the homes of peers. It is estimated that 1 in 10 teens has used a prescription opioid or sedative non-medically. The high number of Vicodin prescriptions written in the US makes the drug of particular concern for teens. Are living in homes with Vicodin and have easy access. Have peers that also use. An addiction professional can make recommendations for which may be appropriate. Vicodin recovery centers can provide you with timely assistance to achieve a drug-free life for you or your family member in need. For more information, call our private hotline at 1-888-993-3112Who Answers?. Our knowledgeable support staff is available 24/7 to answer your questions about rehabilitation and treatment programs.